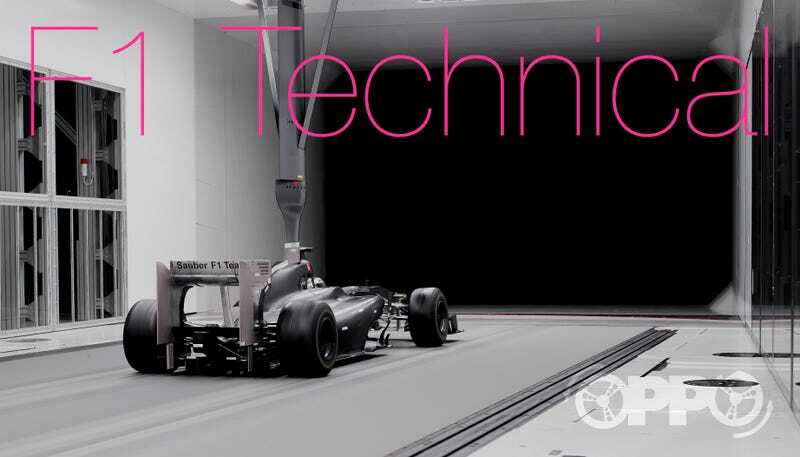 Welcome to OppositeLock's own Formula 1 open technical discussion! The one thing that separates Formula 1 from any other motorsport is the absurd level of engineering and aerodynamic advancement that the teams push on each other, and we are here to appreciate, discuss, and revel in the beauty of design on the current limits of speed. Open discussions in the comments section are welcomed and promoted. I will post a few pictures that I've found interesting on a particular race weekend, and hopefully we'll get some great discussions stirring! These upright elongated vanes look to be either (1) channeling the exhaust between them into the space between the diffuser and tire, or (2) the exhaust is going inward of the inward vane, and the air flowing round the sidepods is being channeled between the two vanes. Red bull carbon brake housing. The carbon with the red markings appears to be there purely for blowing the wheel on the other side; it does not seem to be venting to the brake disks. There appears to be a slot underneath the aforementioned that cools the brakes. McLaren pitot tube aero testing that looks to be testing the efficiency of the front wing in deflecting air around the front tires. Note the tight packaging on the underside of the sidepod radiators in an attempt to keep the centre of gravity as low as possible.